pump, and an 115VAC Service power cord. while water is allowed to seep through the poly bag and into a collection sump. 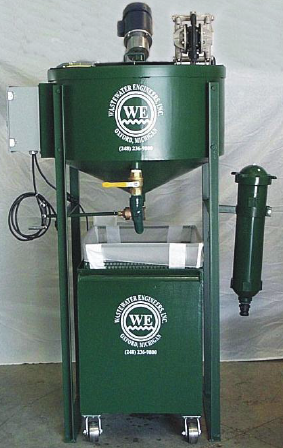 draw and pump effluents from 20 ft and deliver 15gpm@ 25 ft. of head. Pump is mounted to RT unit. mixer upon completion of timer cycle. Ideal for metal working and grinding fluids, vibratory equipment and parts washing fluids, floor cleaning fluids, etc. Operator will push “fill start” button on the control panel that will utilize a fill pump and thus, transfer effluent from its source. The filling will continue until a ‘full’ level is attained – at which time the pump will stop and an indicator light will advise “RT Full”. Transfer pump is air operated. Pump will draw and pump effluents from 20 ft and deliver 15gpm@ 25 ft. of head. Pump is mounted to RT unit. Countdown, mixer/timer. May be set from 0 – 15 minutes. Switch turns on mixer and will shut off mixer upon completion of timer cycle. Canister bag filter (Model WE-625) for final polish of processed fluids. 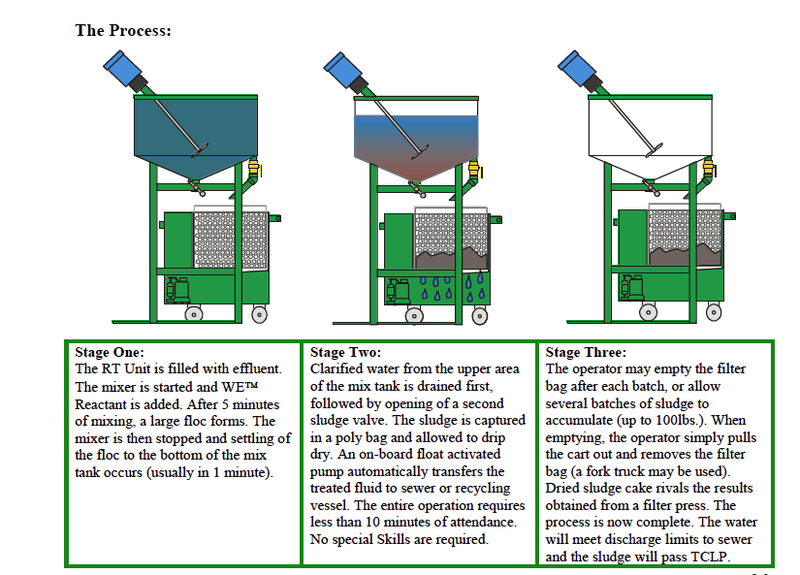 Unit is mounted to RT and will provide capability to capture ‘pin’ floc that may pass through poly bag sludge filter. Unit features a re-usable/cleanable bag. 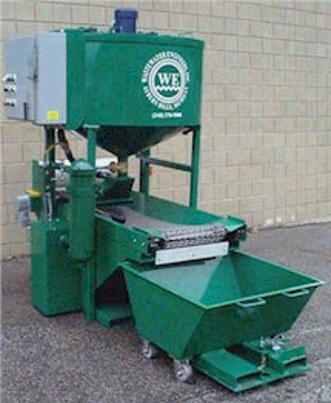 NOTE: Many waste streams require pretreatment – the removal of gross amounts of oils, solids and similar. WE, Inc. designs and supplies complete turn-key components, which will address these requirements. Please see your local sales engineer for details.